I’m busy editing the second book in the The 9 Lives of the Outlaw known as Crazy Cat series – I’ll get back to you about that particular process in a dedicated post. The Cowgirl photo project is also coming along nicely. I expect both books to be ready for release in more or less six months. I’m also working on a book trailer for Embers at Dawn, that I’m hoping to reveal to y’all within a few months. In between editing words and photographs I’ve found the time to take a few pictures of Lee/Ingvild Eiring – I realized that I needed more images to represent my novel and series. I’ve had the idea of making a fake dime novel cover for quite a while and finally got around to put it together. I’ve added a few items featuring the dime novel cover to the Crazy Cat Dry Goods & Sundries shop. 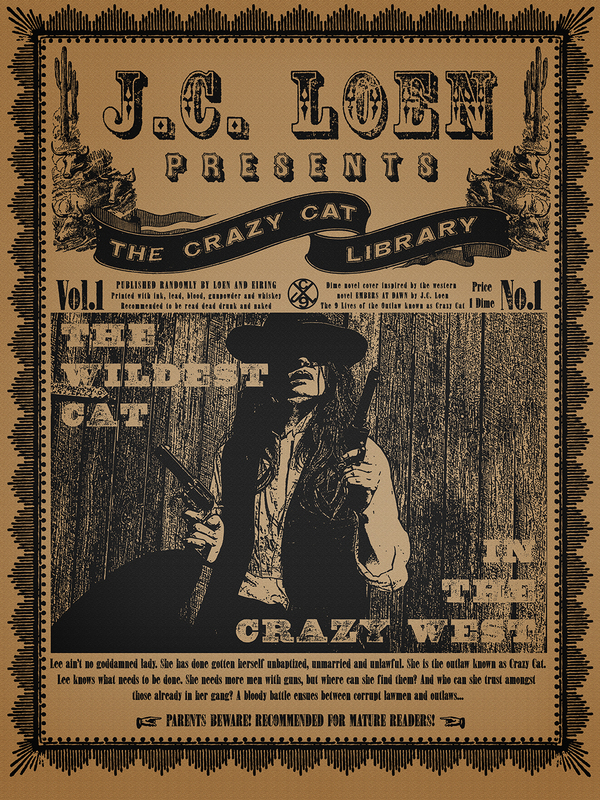 This entry was tagged "old west", 1800s, cover, cover art, cowgirl, Crazy Cat, dime novel, gunslinger, indie author, Ingvild Eiring, revolvers, Self publishing, the 9 lives of the outlaw known as crazy cat, western, wild west. Bookmark the permalink.